“Time is on your side when you own shares of superior companies." Equity markets continued to remain in positive territory this month as trade negotiations between China and the U.S. appeared to be moving in the right direction. President Donald Trump’s comments on extending the tariff deadline on Chinese imports into the U.S. beyond 1st March 2019 also helped market sentiment. However, it is still too early to comment on how the China-U.S. trade talks may conclude. All eyes were also on the Hanoi summit held between President Donald Trump and North Korean leader Kim Jong-un, however, the result was disappointing. Nevertheless, Vietnam was in the spotlight again due to hosting the summit and the attention the country has gained due to this event could have a positive spill over on the tourism sector. We are very positive on Vietnam’s tourism sector over the next three to five years as the growth of low-cost carriers and the short flight time between many Asian cities and Vietnam makes the country a convenient tourism hotspot. Tensions between India and Pakistan built up this month due to skirmishes in Kashmir and while the situation is under control as of now, an upcoming election cycle in India may not lead to significant reductions in cross border hostilities. Furthermore, any distractions to Pakistan from such issues could impact the government’s focus on turning around the economy. Our on-the-ground visits continued with trips to Myanmar, Jordan and Oman. Though the latter two countries are not yet part of our investment universe, we conducted an initial research trip and you will read more about these visits in our upcoming travel reports over the next few months. The AFC Asia Frontier Fund (AAFF) USD A-shares lost −0.04% in February 2019. The fund outperformed the AFC Frontier Asia Adjusted Index (−0.5%) but underperformed the MSCI Frontier Markets Asia Net Total Return USD Index (+7.4%), the MSCI Frontier Markets Net Total Return USD Index (+0.8%) and the MSCI World Net Total Return USD Index (+3.0%). 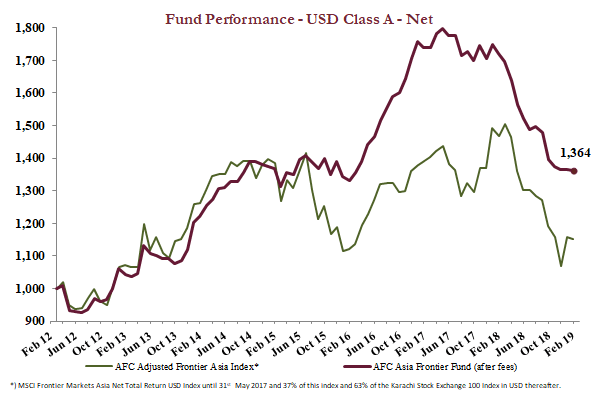 The performance of the AFC Asia Frontier Fund A-shares since inception on 30th March 2012 now stands at +36.4% versus the AFC Frontier Asia Adjusted Index, which is up +15.3% during the same time period. The fund’s annualized performance since inception is +4.6% p.a. The broad diversification of the fund’s portfolio has resulted in lower risk with an annualized volatility of 9.13%, a Sharpe ratio of 0.44 and a correlation of the fund versus the MSCI World Net Total Return USD Index of 0.36, all based on monthly observations since inception. Global equities continued to witness bullish sentiment in anticipation of a positive outcome between China and the U.S. with respect to trade negotiations. 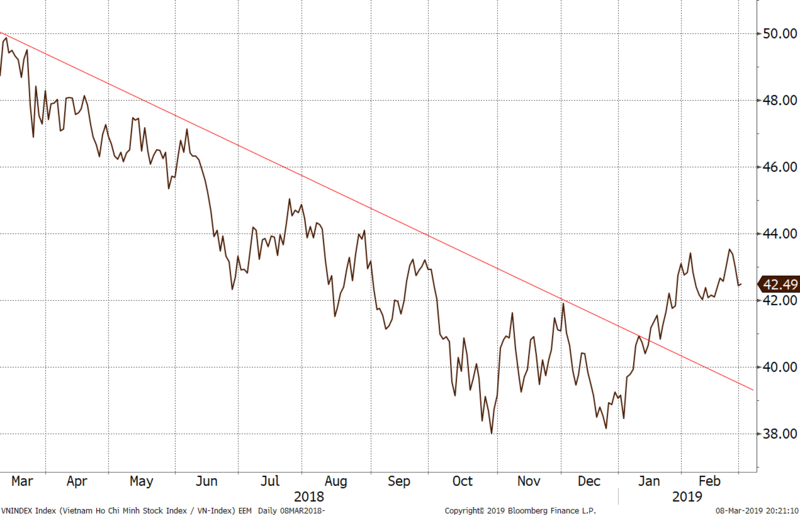 With President Trump extending the 1st March 2019 tariff deadline, optimism across global equity markets continued to build. Vietnam was no exception to this optimism given its dependence on trade. As a result, the Ho Chi Minh VN Index rallied by +6.0%. However, a majority of this rally was led by a few stocks, namely, Vingroup, Vinhomes and Vincom Retail. Nevertheless, despite the fund not owning these stocks due to their valuations, the fund’s holdings in Vietnam continued to do well for another month as returns were led by a consumer staples company, a construction services company, an industrial park developer and an airport operator, all of whom have been showing good quarterly results over the last few quarters and are well tied into the strong consumption and industrial growth of the country. The much-anticipated summit between U.S. President Donald Trump and North Korean leader Kim Jong-un took place in Hanoi but ended with a whimper. 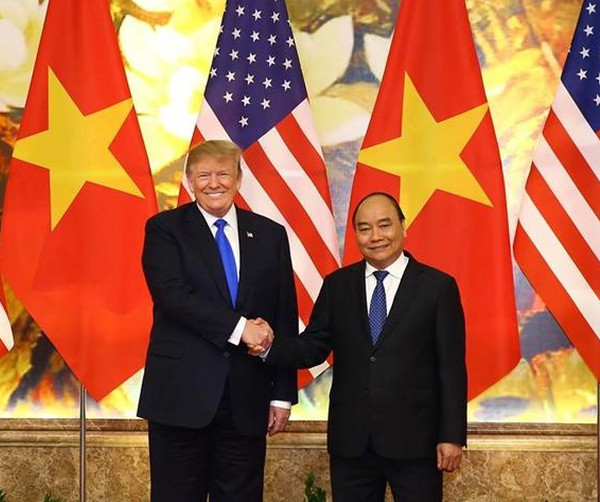 However, Vietnamese companies used the summit as an opportunity to sign new deals worth USD 21 bln with U.S. companies — Boeing and General Electric — for supply of airplanes and jet engines to Vietjet and newcomer Bamboo Airways. This should reduce some of the worries over the trade deficit that the U.S. has with Vietnam given the current U.S. administration’s focus towards trade deficits. Furthermore, the attention Vietnam received from hosting the summit can have a positive impact on the tourism sector, an industry and theme we are very positive on over the next three to five years. After rallying by 8.1% in January, the Bangladesh stock market took a breather as most banking stocks corrected. However, the fund’s holdings outperformed the Dhaka Stock Exchange Broad Index due to positive moves in the fund’s consumer focused holdings, namely a tobacco company, a pharmaceutical company and a bank. On the macro front, garment exports continue to do well, with growth picking up over the past few quarters with this financial year so far seeing a year over year growth of 14.5%, a much faster pace compared to the previous two financial years. Military tensions between India and Pakistan kept the Pakistani market weak this month due to the recent skirmishes in Kashmir. The fund has been underweight Pakistan for the last few quarters due to the economic uncertainties and with relations with India expected to remain tense, besides hurting market sentiment it could also distract the government from turning around the economy. Despite the Mongolian market being weak this month, the fund’s Mongolian holdings significantly outperformed the MSE Top 20 Index due to positive moves in three of the junior mining companies the fund holds in the coking coal and copper/gold segment. Uzbekistan saw the Agency for State Asset Management, which was established in January, take responsibility during the month for managing the privatization of the government’s (largely majority) interests in several dozen companies ranging from banks to consumer goods, construction materials, insurance and manufacturing. Most of these companies are already listed, so over the coming years, as these stakes are privatized, we expect to see a marked improvement in the quality of management and supervisory boards as well as liquidity and operational performance as members of the state are replaced by private sector executives. In-line with the close to 4% rally in the Kazakhstan Stock Index this month, the fund’s only holding in the country, a bank, witnessed a rally of +12.9%. Overall, despite a good run for the fund’s holdings in Vietnam, Bangladesh, Mongolia, and Kazakhstan, performance was hurt by the correction in the Iraqi stock market, which impacted the fund’s performance by close to 50 basis points. The best performing indexes in the AAFF universe in February were Vietnam (+6.0%), Kyrgyzstan (+4.2%), and Kazakhstan (+3.8%). The poorest performing markets were Iraq (−9.7%) and Pakistan (−4.3%). The top-performing portfolio stocks this month were a drug store operator from Uzbekistan (+112.5%), a junior copper/gold miner from Mongolia (+40.0%), a Mongolian cashmere producer (+25.8%), a Mongolian hotel operator (+21.0%), and a Vietnamese consumer conglomerate (+14.4%). In February, we added to existing positions in Mongolia, Uzbekistan, and Vietnam and added a Pakistani bank and two new companies in Uzbekistan: a cable producer and a municipal architecture EPC. We exited one oil/gas distributer in Pakistan, a food producer, and a steel company in Vietnam. We partially sold 3 Mongolian companies and a company in Laos. As of 28th February 2019, the portfolio was invested in 108 companies, 1 fund and held 5.7% in cash. The two biggest stock positions were a pharmaceutical company in Bangladesh (7.6%) and a pump manufacturer from Vietnam (5.2%). The countries with the largest asset allocation include Vietnam (25.7%), Bangladesh (20.1%), and Mongolia (18.0%). The sectors with the largest allocations of assets are consumer goods (29.7%) and industrials (22.0%). The estimated weighted average trailing portfolio P/E ratio (only companies with profit) was 12.30x, the estimated weighted average P/B ratio was 1.91x, and the estimated portfolio dividend yield was 4.16%. 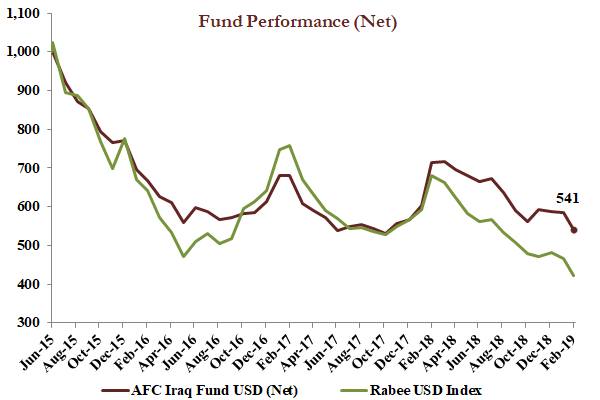 The AFC Iraq Fund Class D shares returned −7.5% in February with a NAV of USD 541.45 which is an out-performance versus its benchmark, the Rabee USD Index (RSISUSD index) which lost −9.7% for the month. Year to date the RSISUSD is down −12.5%, while the fund performed −7.9% YTD. The month’s decline takes the index below the multi-year lows made in May 2016, for a decline of −70% from the multi-year highs of January 2014 to February 2019, versus the −68% decline from the same highs to May 2016. However, the severity of the decline and the immediate triggers are the only things that the two months have in common, while all other indicators, both fundamental and technical, are diametrically opposed. The immediate trigger for the decline in the last two months was a foreign portfolio liquidation, the same trigger behind that of the period leading into May 2016. However, the similarity ends there, as the current foreign liquidation is that of a relatively small single portfolio versus the massive multi-month liquidation witnessed then as the chart below demonstrates. 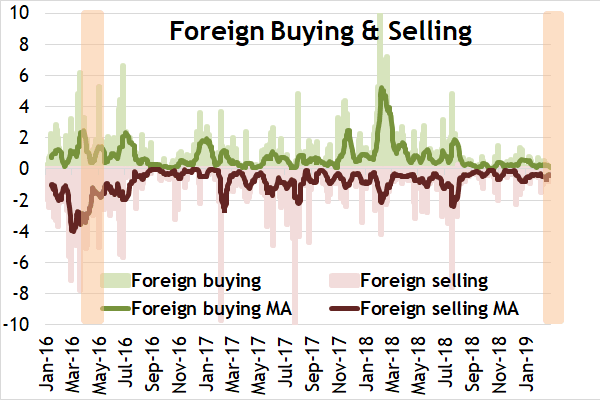 The above chart is an index of the absolute level of foreign selling & buying with their respective moving averages, clearly showing the contrast between the two periods (both highlighted in light orange). The main reason for the similarity, in effect of the selling on the index, is due to the extremely low liquidity in the current market - a low level that has been discussed in “Volumes and Reversion to the Mean”. 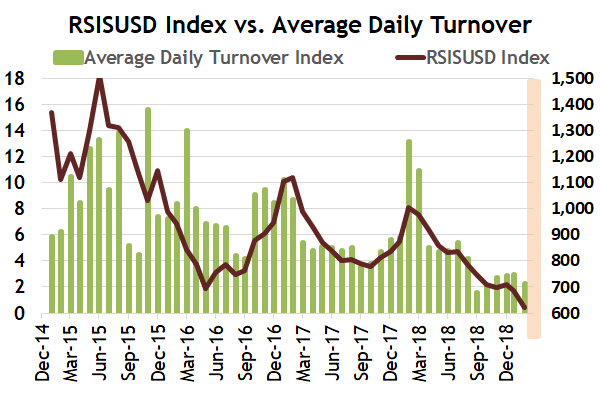 The average daily turnover per month since late 2014 (chart below) shows the association of low turnover with the index levels. Moderate selling in such an environment of extremely low liquidity exerts a strong downward pressure on prices, which coupled with low prices turns a few price increments into much larger percentage moves. A case in point is Bank of Baghdad (BBOB), which started the month at IQD 0.280 per share. Due to selling it declined to IQD 0.250 by month’s end. This is equal to three price increments (the minimum price increment is IQD 0.010), yet it is a −10.7% decline from 0.280 to 0.250, which in turn accounted for a −1.2% downward move in the index. Another issue of low liquidity is how it affects higher priced stocks, resulting in them trading in much larger price increments, with the end result producing the same percentage change effects as for the lower priced stocks. The macro picture between 2016 and now couldn’t be more different. In 2016 Iraq’s economy was being crushed by the double whammy of collapsing government revenues, due to falling oil prices, and the sharply increasing cost of the ISIS war - a war that many international commentators believed marked the end of the Iraqi state. However, the end of the ISIS war cemented Iraq’s integrity and its position as a key player in the Middle East. This is evidenced by the high number of heads of state and high-level official visits to Iraq over the last few months as relationships which were forged during the ISIS-conflict are being developed into future economic relationships. 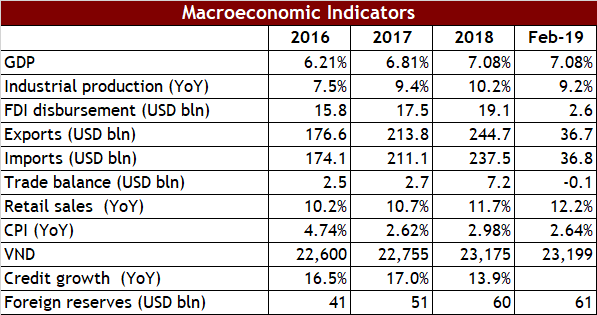 On the other hand, the economy in 2019 is gradually benefitting from the expansionary effects of the reversal of the forces that crushed it. In particular, the healing effects of higher oil revenues over the last two years is beginning to filter down into the broader economy with the first signs being seen in the recent recovery in broad money, or M2, which acts as a proxy for economic activity, as can be seen in the chart below. 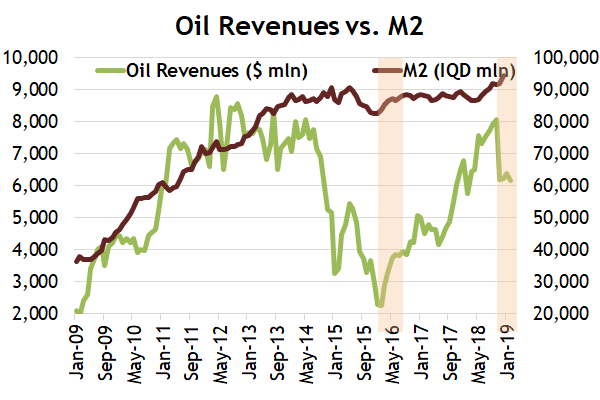 A mirror image reversal is taking place in 2019 as multi-month increases in oil revenues have revived M2 which points to an economic recovery. The early signs of this are evidenced in the growth of customer deposits (consumers, businesses and government) with banks, which can be seen in the chart below through the growth of the IQD Current Account (C/A) component of banks’ reserves with the Central Bank of Iraq (CBI) – the recovery of which accelerated in May 2018, with the latest data as of early February indicating a continuation of this trend. Just as the negative fundamental forces in 2016 were the reason for the market’s decline, their reversal and the early signs of economic recovery should lead to an economic growth which must find its way into corporate earnings recovery - which in turn should lead to a rising market. 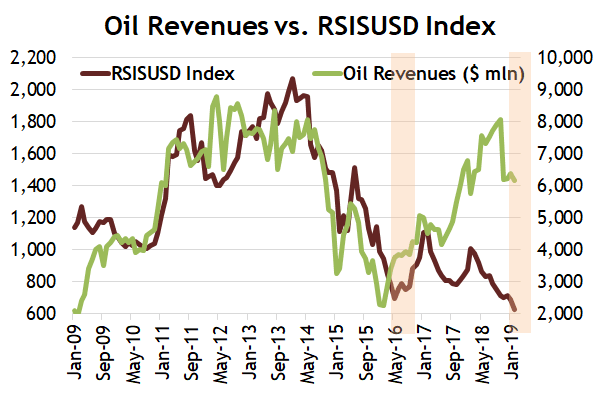 Logically, this ought to mean an end to the market’s divergence from its past close relationship with oil revenues (a proxy for the forces driving the economy) which is currently at the widest it has been for the last few years (see below). 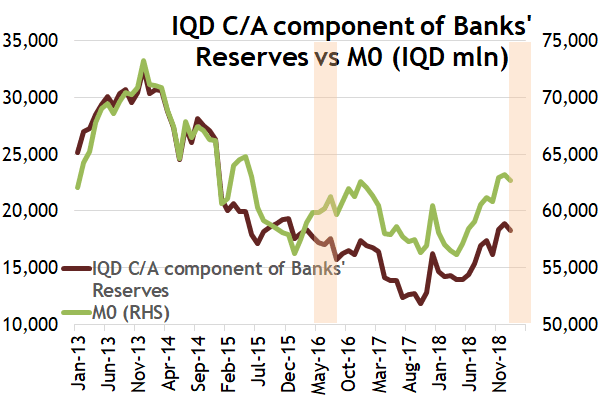 In conclusion, the fundamentals seen in prior charts surely argue that it’s only a matter of time before the liquidity in the broader economy finds its way into the Iraqi equity market, the reigning ugly duckling of frontier markets, to turn it into a swan or at least into a duck that flies. As of 28th February 2019, the AFC Iraq Fund was invested in 14 names and held 4.6% in cash. The fund invests in both local and foreign listed companies that have the majority of their business activities in Iraq. The markets with the largest asset allocation were Iraq (90.4%), Norway (4.1%), and the UK (0.9%). The sectors with the largest allocation of assets were financials (50.1%) and communications (20.1%). The estimated trailing median portfolio P/E ratio was 9.41x, the estimated trailing weighted average P/B ratio was 0.78x, and the estimated portfolio dividend yield was 8.29%. 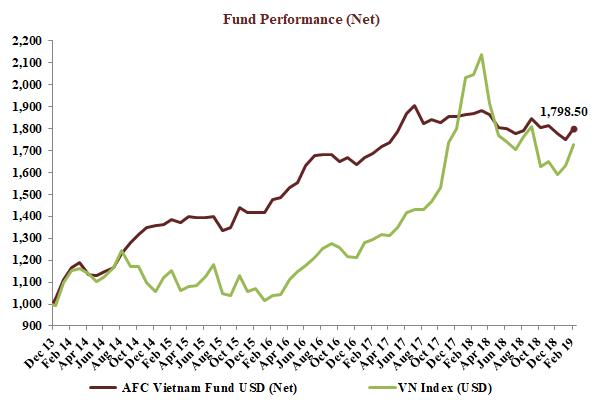 The AFC Vietnam Fund gained +2.9% in February with a NAV of USD 1,798.50, bringing the return since inception to +79.8%. This represents an annualized return of +12.0% p.a. The Ho Chi Minh City VN Index in USD gained +6.0%, while the Hanoi VH Index added +2.9% (in USD terms). The broad diversification of the fund’s portfolio resulted in a low annualized volatility of 8.65%, a high Sharpe ratio of 1.29, and a low correlation of the fund versus the MSCI World Index USD of 0.26, all based on monthly observations. Three of the top index components were almost solely responsible for the strong performance of the HSX index and the outperformance against everything else (sector- and index wise) in February, especially during the second half of the month. The market breadth was weaker over the past two weeks, but over the full month we saw gains on improving volume across the board. Three big contributors of the index gains are related (the Vingroup family of companies) and were pushed up mostly by domestic investors, despite the biggest company, Vingroup, publishing a declining profit for 2018. Without any (good) news, this advance added USD 3 bln in market capitalization to these three companies and lifted their P/E ratios to 101x (Vingroup), 19x (Vinhomes) and 44x (Vincom Retail). If we exclude these 3 stocks, the market with its approximately 1,500 listed stocks and several indices would have been up by a more modest 3.7% in February. Since most companies have already published their (unaudited) results, we would like to share our observations about the developments of earnings and valuations, especially in relation to our portfolio holdings. Back in our May 2018 interim report we showed the earnings valuation of our portfolio, divided into several groups. We updated the same overview since it provides an interesting comparison over this time frame given that the “market” is now only slightly lower than after the strong correction in April/May of last year. The “market” unfortunately often refers to the most popular index, the HSX index (Ho Chi Minh index), with some of its index constituents not open to foreign investors due to foreign ownership limit restrictions. On the other hand, the Hanoi index with its biggest index component, Asia Commercial Bank (having a 19% weighting and also not available to foreigners) is currently around 15% lower than in May 2018, along with the majority of stocks listed in Vietnam. When we look at the 2018 earnings of the top 5 index components of the VN30 (an index which combines stocks from both exchanges) and which are weighted at around 60% in the index, we see that 2 out of those 5 companies had declining profits in 2018. That does not mean that the overall picture for earnings was very bad in Vietnam - actually the overall profit growth was estimated at 12-14% for last year - but it shows that “big” does not mean better and profit growth distribution is not homogeneous throughout the market in Vietnam. The same can be said for the current valuation of the market, as it is far from normal that a country with two stock markets (or three if we count UPCOM as another separate market) has widely different valuations in terms of earnings multiples from 8.7x (Hanoi) to 16.6x (HCMC). It seems both domestic and foreign investors are still racing for the same stocks, echoed by the top 5 VN30 index components which currently have P/E ratios of 101x, 19x, 28x, 15x, and 16x and dividend yields of 0%, 0%, 2.8%, 1.3% and 3.1%. On the other hand, our portfolio currently consists of 67 stocks, all of which are profitable and the majority of which are paying attractive cash dividends. All of our top 5 holdings were able to grow their ordinary profits last year and the overall valuation is very attractive as one can see from the graph below. The comparisons are from May 2018 when we had a few more stocks compared to today, as we exited a few, mostly smaller companies in recent months. More than 90% of the stocks we own are cheaper than the market average and more than half of them have a trailing P/E of less than 8x! With sentiment towards Emerging Markets finally improving after a year-long correction, we again see more investors looking for value, which can easily be found in the Vietnamese small- and midcap segment. iShares MSCI Emerging Markets ETF - 12 Months. 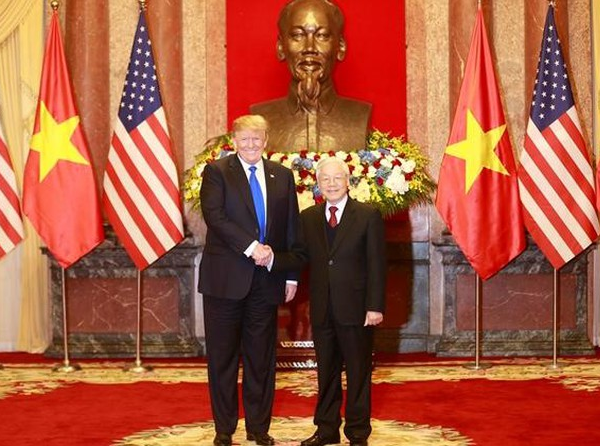 Even though this meeting ended without a joint agreement, the Vietnamese Prime Minister, Nguyen Xuan Phuc, and President, Nguyen Phu Trong, were able to meet with US president Donald J. Trump ahead of the North Korean Summit and signed several commercial trade deals between their two countries, worth around USD 20 bln, such as Vietnam’s Bamboo Airways and VietJet Aviation JSC’s deals to buy 110 aircraft from Boeing Co.
“Trade war” beneficiaries such as Vietnam are broadly considered as attractive alternatives for the relocation of production from China and we believe this will help to drive continued fast-paced growth for the country in 2019. The total workforce of Vietnam is about 60% of the population, or 55 million people. Vietnamese employees are considered to be highly educated and hardworking. According to OECD, Vietnam has one of the highest PISA scores in the world. 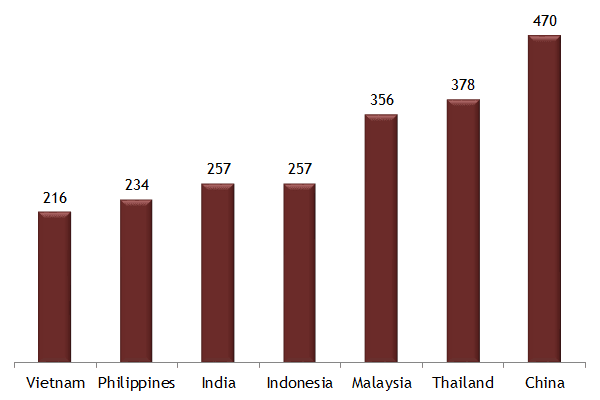 Furthermore, labour costs in Vietnam are quite competitive compared to other regional countries. According to Natixis, the average monthly wage in Vietnam is around USD 216, compared to USD 257 in Indonesia, USD 378 in Thailand and USD 470 in China. Vietnam has signed 16 bilateral and multilateral trade agreements with the WTO, ASEAN, the U.S., Japan, South Korea and the EU, and is also a member of the Comprehensive and Progressive Agreement for Trans-Pacific Partnership (CPTPP). These free trade agreements are an important factor helping to boost Vietnam’s exports. 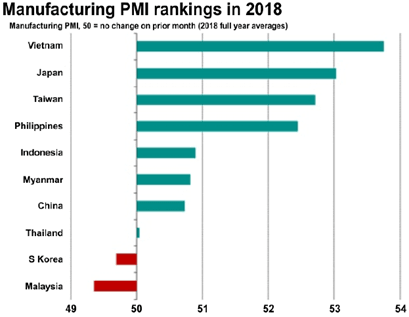 In addition to European and US companies, there are now also an increasing number of Chinese companies which are considering shifting their production to Vietnam in order to benefit from low labour costs and avoid punitive taxes from the US. In 2018, total FDI (Foreign Direct Investments) disbursement reached USD 19.1 bln, increasing 9.1% and we expect this uptrend to continue. According to the State Bank of Vietnam (SBV), total purchased foreign currency in January is estimated at around USD 4 bln, lifting the nation’s reserves to USD 61 bln. Stability in the FX rate continued in February, supported by solid FDI and exports. SBV has released a draft circular seeking public comment on the implementation of changes made to the Law of Credit Institutions in late 2017, namely the power of the SBV to adjust the reserve ratio requirement (RRR) for selected banks. The RRR in Vietnam for VND deposits currently ranges from 1% to 3% depending on the type of deposit. This circular will be applied to only a few selected banks. Most of them are state owned commercial banks such as Vietcombank (VCB) and Vietinbank (CTG). 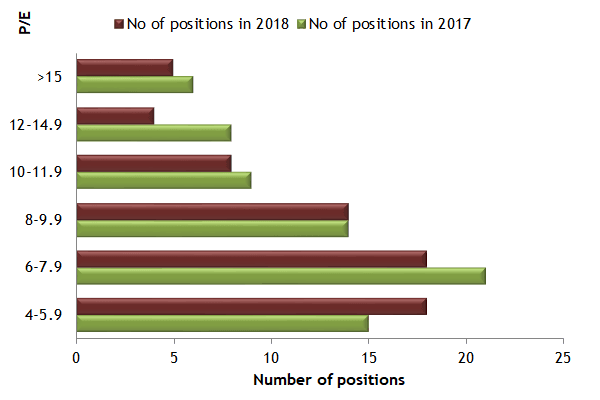 At the end of February 2019, the fund’s largest positions were: Agriculture Bank Insurance JSC (4.1%) – an insurance company, Vietnam Container Shipping JSC (3.3%) – a container port management company, Sametel Corporation (3.2%) – a manufacturer of electrical and telecom equipment, Idico Urban and House Development JSC (2.4%) – an energy, construction, and real estate business, and TanCang Logistics and Stevedoring JSC (2.3%) – a logistics company. The portfolio was invested in 67 names and held 2.8% in cash. The sectors with the largest allocation of assets were industrials (34.9%) and consumer goods (30.7%). The fund’s estimated weighted average trailing P/E ratio was 8.71x, the estimated weighted average P/B ratio was 1.39x and the estimated portfolio dividend yield was 7.58%. This Newsletter is not intended as an offer or solicitation with respect to the purchase or sale of any security. No such offer or solicitation will be made prior to the delivery of the Offering Documents. Before making an investment decision, potential investors should review the Offering Documents and inform themselves as to the legal requirements and tax consequences within the countries of their citizenship, residence, domicile and place of business with respect to the acquisition, holding or disposal of shares, and any foreign exchange restrictions that may be relevant thereto. This newsletter is not intended for distribution to or use by any person or entity in any jurisdiction or country where such distribution or use would be contrary to local law and regulation, and is intended solely for the use of the person to whom it is intended. The information and opinions contained in this Newsletter have been compiled from or arrived at in good faith from sources deemed reliable. Opinions expressed are current as of the date appearing in this Newsletter only. Neither Asia Frontier Capital Ltd (AFCL), nor any of its subsidiaries or affiliates will make any representation or warranty to the accuracy or completeness of the information contained herein. Certain information contained herein constitutes “forward-looking statements”, which can be identified by the use of forward-looking terminology such as “may”, “will”, “should”, “expect”, “anticipate”, “project”, “estimate”, “intend”, or “believe” or the negatives thereof or other variations thereon or comparable terminology. Due to various risks and uncertainties, actual events or results or the actual performance of Funds managed by AFCL or its subsidiaries and affiliates may differ materially from those reflected or contemplated in such forward-looking statements. Past performance is not necessarily indicative of future results. The representative of the Funds in Switzerland is Hugo Fund Services SA, 6 Cours de Rive, 1204 Geneva. NPB Neue Privat Bank AG, Limmatquai 1 / am Bellevue, CH – 8024 Zürich, Switzerland is the Swiss Paying Agent. In Switzerland, shares shall be distributed exclusively to qualified investors. The fund offering documents, articles of association and audited financial statements can be obtained free of charge from the Representative. The place of performance with respect to shares distributed in or from Switzerland is the registered office of the Representative. AFC Asia Frontier Fund is registered for sale to qualified/professional investors in Japan, Singapore, Switzerland, the United Kingdom, and the United States. AFC Iraq Fund in Singapore, Switzerland, the United Kingdom, and the United States. AFC Vietnam Fund in Japan, Singapore, Switzerland, and the United Kingdom. © Asia Frontier Capital Ltd. All rights reserved.